Looking for things to do when in Dochamps? On this page, you will find all the sights in the area. From interesting museums and nice shops to the nicest restaurants. You can also discover zoos, amusement parks and many other places of interest here. Brandsport organises challenging outdoor sporting activities with the focus on recreation and enjoyment. Based on a personal, high-quality and small-scale approach, they work with small groups and offer good supervision, excellent equipment and suitable locations for the activities. At Brandsport you can follow a course, book an activity programme, arrange a comprehensive and fully catered business event, or hire a kayak, canoe or mountain bike and explore the area on your own. Activities range from kayaking, mountain biking, rafting, caving, rock climbing & abseiling, archery, woodland treks with horses to rope bridges, zip lines and zip course. Adventure Valley Durbuy is an adventure & nature park that also propose activities ‘à la carte’ like kayaking, mountain biking, laser game, an escape room and a touristic train in Durbuy. In the heart of the Ardennes, the paintball Ferme Aventure, and this since 2003, offers you the opportunity to fully relax for a few hours. If you really want to go completely away from home, you obviously do not cook yourself. 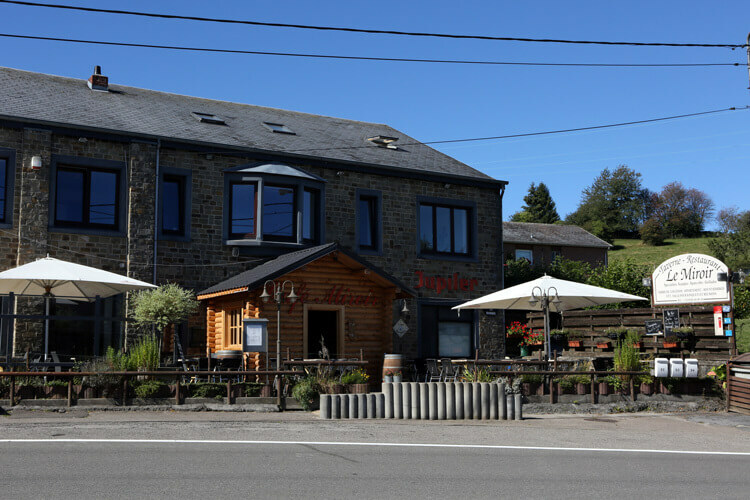 In the local Taverne “Le Miroir” it is possible to “outsource” all meals, so in the morning you can take a seat for breakfast, possibly a packed lunch when you go mountain biking and in the evening go all cosy with the stone grills or eat spareribs. Choosing from the extended menu is of course also possible. 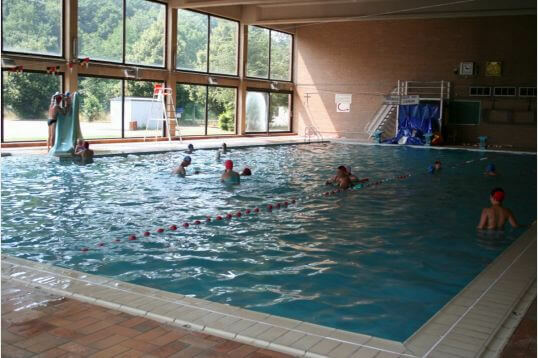 For swimmers, the municipal swimming pool of La Roche-en-Ardenne is an ideal place to train, especially on days that the lovely weather is not what you’re expecting. The municipal swimming pool of La Roche-en-Ardenne is located on the outskirts of the city, on the banks of the Ourthe. It is open from the Carnival holiday until the beginning of December. 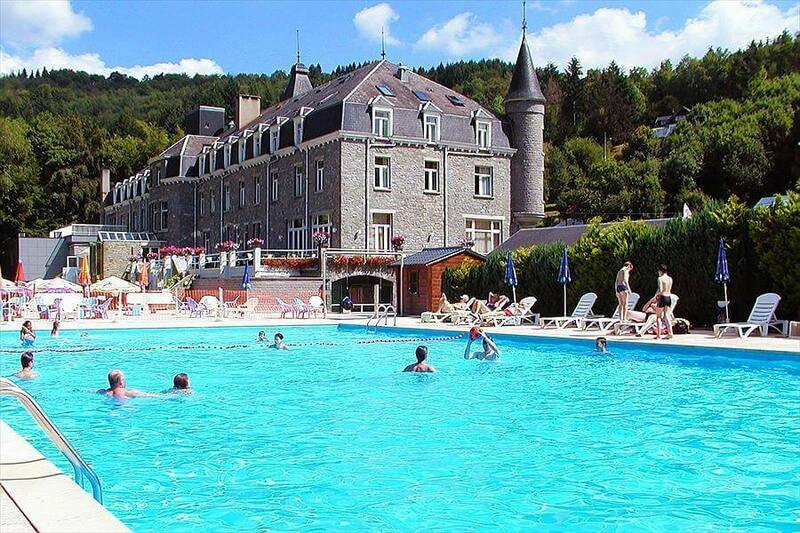 This beautiful outdoor swimming pool is located in the garden of a hotel in the heart of La Roche en Ardennen. Parking, deck chairs, eatery …, all necessary accommodation is available on site. Entrance fee: 1 € in the morning, 2 € in the afternoon. Only open in the months of July and August. 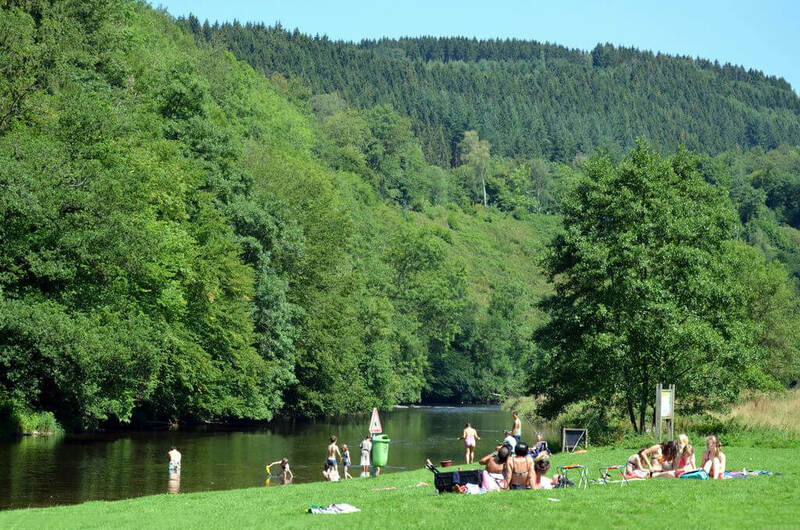 On the banks of the Ourthe lies “Plage Maboge”, in certain places the water is deep enough to swim. Also recommended for small children, you can park your car in a closeby parking, 5 minutes away by foot or only to minutes if you go straight through the water. Next, to the swimming in the river, you can relax on the lawn, play on the playground, or make use of one of the two public barbecues. In the pavilion, where there are also changing rooms and showers, you can buy a refreshment or ice cream. (furnished with toilet and dressing rooms). 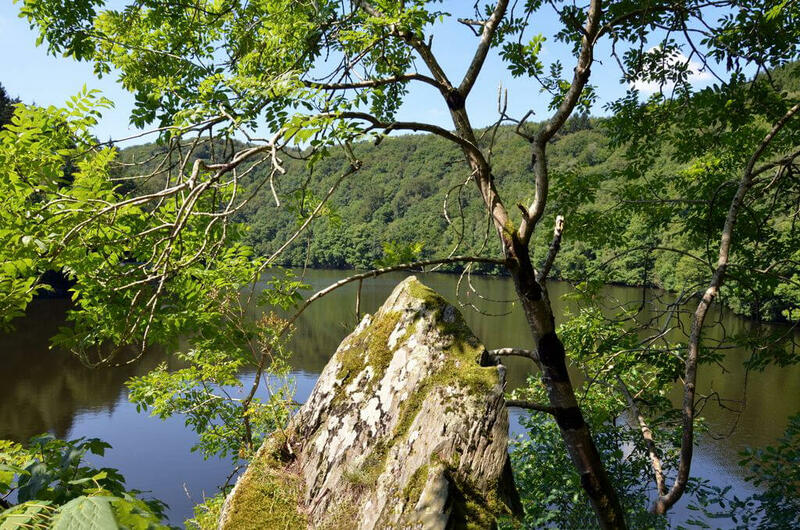 Fed by the Ourthe, located by the Nisramont dam, its large area (47 hectares) makes is the perfect place to feel in harmony with nature. You can swim, fish, kayak or canoe from many locations on its banks. You will also find covered picnic/BBQ areas, with tables and benches. If you prefer walking, a 14-km marked itinerary will guide you around the lake: a lovely hike (+- 4h), ranging from intermediate to difficult. In Vielsalm you will find the lake of ‘Les Doyards with a surface area of 15 hectares’. Every summer various musical animations take place in a beautiful pavilion on the lake. You can go boating (water bike), and enjoy on the beach lawn along the banks. A playground and a cafeteria ensure that the children have fun and the parents can relax. Please note, swimming in the lake is forbidden. 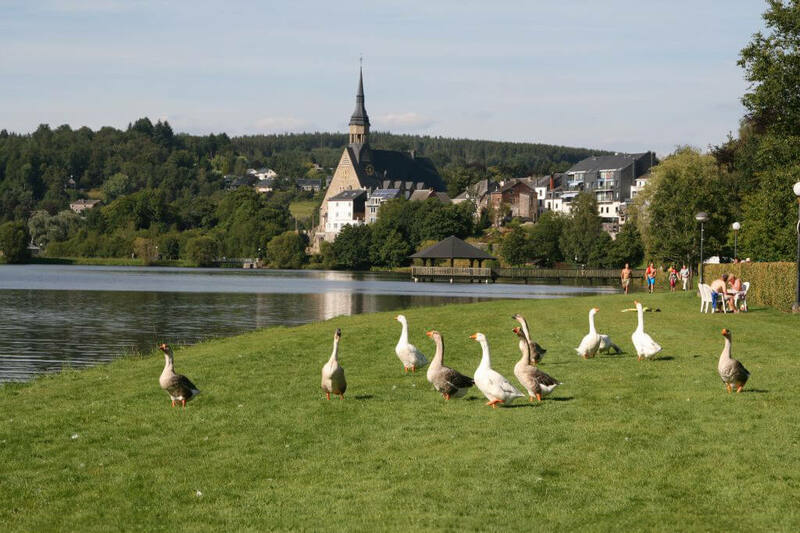 For fish lovers, it is permitted to fish with a fishing permit from the Walloon Region. The lake “Les Doyards” is known for the size of its fish. Once a fisherman caught a fish of 1.17m and 15 kg. Go ahead!